Terra Forming Terra: Whale Graveyard? This is unexpected and the numbers even more unexpected. I would like to see these well studied in order to determine just what happens to the skeleton. Do they also breakdown? I expect so, but this is our chance to find out. The reason I ask this is that we do have an ancient rare seabed fossil that was subjected to the same environment. It would be good to know just how unique fossilization happens to be. Not quite an elephants graveyard but it certainly smacks of just that. The chance discovery of a deep-sea "graveyard" is helping scientists to shed light on the fate of dead ocean giants, scientists report. 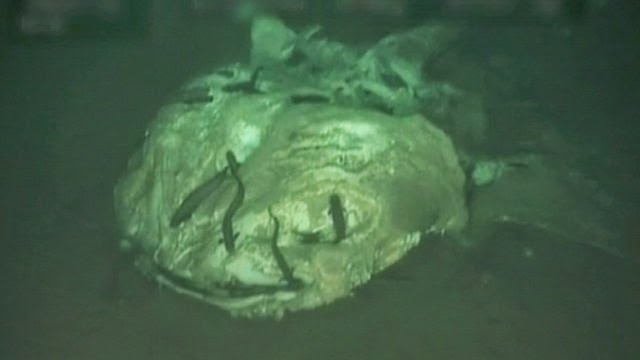 Footage recorded by the oil and gas industry shows the carcasses of four large marine creatures in a small patch of sea floor off the coast of Angola. Around the dead whale shark and three deceased rays, scavengers flocked to the food bonanza. Lead author Dr Nick Higgs, from the University of Plymouth's Marine Institute, said: "There's been lots of research on whale-falls, but we've never really found any of these other large marine animals on the sea bed." Whale carcasses are home to complex ecosystems, first attracting scavengers such as sharks, then smaller opportunists such as crabs and shrimp-like creatures called amphipods. Osedax - or "zombie worms" - feed on the animal's bones, while specialist bacteria break down fats. But with this latest footage, scientists have been able to see how the feeding frenzy that takes place around other big animal carcasses compares. The video was recorded by remotely operated vehicles (ROVs), which were surveying the seafloor around Angola for industrial exploration. The dead creatures were found between 2008 and 2010 on a one-square-kilometre patch of the sea floor and had been dead for an estimated one or two months. The researchers mainly found scavenging fish - up to 50 around each carcass. "We found three to four different types - but what really dominated were eel pouts. These normally sit around the carcass and wait for smaller scavengers - amphipods - to come along, and they will eat them," said Dr Higgs. "There were lots of these fish sitting around the carcasses - they seemed to be guarding it." But the team did not find other animals, such as the bone-eating worms, lurking around the dead whale shark and rays. "Absence of evidence isn't evidence of absence... but the ecosystem does seem different to whale falls," said Dr Higgs. The team was not sure why, given how rare sightings like this are, that four dead animals were all spotted in a small area. Dr Higgs said: "There are lots of these animals living in the surface waters, and through natural mortality, you will have an increased abundance of dead animals on the seabed. The reason we found them could be because of this industrial survey work - there are very few places surveyed as intensively as these areas." The researchers estimated that the carcasses of large animals could provide about 4% of the total food that arrives on the sea floor in this area. "These large carcass falls can be quite common and support quite a few fish in terms of the amount of food coming down there - there may be easily enough to support fish populations."